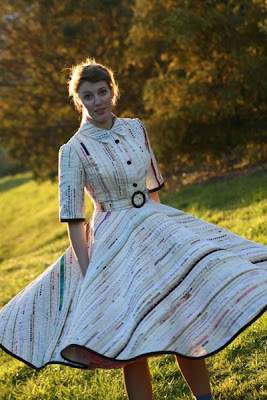 Selvage Blog: See Genius/Artist/Quilter Jodie Carleton's Creation!! See Genius/Artist/Quilter Jodie Carleton's Creation!! A friend emailed your blog site to me because I use itty bitty scraps as well as selvage edges in my art quilts. It was fun looking through all your posts and discovering you're the one who "wrote the book". Thanks. WOW, just doesn't seem like enough! Incredible creative and inspirational. Thank you for sharing. I have been spinning with ideas ever since I discovered your blog, but now.........there will be no end to what can be done with selvages! I can't imagine sewing all these together. I am in awe. 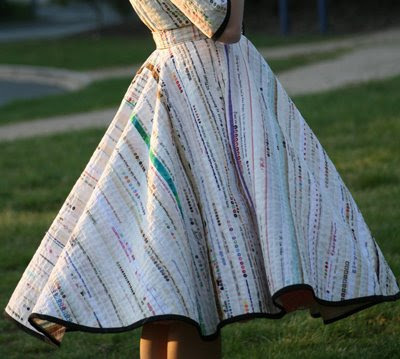 i think i am in love...that dress and photo are spectacular! WHOA! that is such a beautiful dress! it must have took ALOT of time. she is so talented! This has to be my all-time favorite project EVER!! LOVE...LOVE..L-O-V-E...The selvage dress and the selvage chair!!! They're wonderful. Would love for you to visit our blog at www.quiltstoriesbysherryann.blogspot.com to view Laverne Brackens works and the quilts she creates from tiny pieces of cloth.Laverne is my mother. So Katheryn Hepburnish. Very beautiful. Looks like it was very labor intensitve. Congratuations to a great design. Just Stick with the Candy! Possibly the Strangest Fabric Ever! Selvage Quilt Juried into AQS Des Moines Show! Liberated Selvage Quilt by Margie Fisher! Lots of Text on this Quilt! Talk About Quilts With Words! Last Chance to See the Red Zinger Selvage Quilt! Join Me on this Trip to NYC! Onion Chair Delights Receptive Hearts! Font Fabric From Faraway Australia - Wow! "Hello, I'd Like 5 Pounds of Selvages, Please"